It’s no secret that the Bullet Journal system has allowed me to make incredible changes in my life and stay on top of my work and personal life. This flexible system has dramatically reduced tasks that slip through cracks, and given me intention in my days. Most importantly, I’ve stuck with it longer than 3 months! If you follow me on Instagram or on this blog, you’ll also know I am an instructor and work in higher education in the USA. My responsibilities range from teaching to curriculum writing to program coordination, and so on – I noticed there are many other Bullet Journal Junkies that do the same thing! To share some of my tips and tricks, I’ve put together a video and this blog post explaining how I bullet journal as a teacher and administrator. The beauty of this system lies in its endless flexibility and ability to adapt to what you want it to do. The Mystique of planners, if you will. And without further ado, layouts for an educator’s bullet journal! Your signifier symbols should be meaningful to you and how you’ll indicate things like tasks and appointments. I use pretty standard icons – I don’t like to do too many different icons because it takes up too much mental capacity, so I keep these basic. I DID add the delegation and connection icons in my legend. When working a lot with a team, I needed to identify when I had taken tasks off my plate, and this works wonderfully as a record. I also have a heart for connections – when you work with students and have a strong team environment, I wanted to acknowledge these joyful moments that happen. My day isn’t always just about production, and wanted to capture that with this icon. The index is your log of relevant pages in your bullet journal. In this photo I’ve split it up to provide some general categorization of different pages. Sometimes people ask if you need to index your dailies or weekly layouts – I don’t think so. I think it’s easy enough to keep track of your planning pages and it takes up a lot of space to track them – so I would only index pages like collections and notes. Perhaps many of you have your calendars online, which takes care of future planning, but perhaps you want to use the bullet journal version. Here is a slightly upgraded version of Ryder’s original. I like to section off different areas – in this case, tasks are different than events, which gives you an easier way to reference your upcoming professional development, conferences, or research appointments. You can also print out the traditional grid calendar, a familiar layout that is easy to print off instead of draw. Part of living intentionally is knowing what you’re doing the work FOR – so keeping goals at the forefront of your journal can help you stay on track throughout the semester or the year. Whether they are from your annual review and created with your boss, perhaps they are standards for the district, number of attendees to programs, or something that you’re setting for yourself, listing them and fleshing out key milestones will help you avoid the trap of time slipping away in the midst of prep and writing proposals. Check out some other posts where I talk about reflection, action planning, and goal setting. This layout is an evolution of Ryder’s original monthly layout, which lists the month on top and the days/dates on the side. By adding additional columns you can fill in tasks related to the different parts of your job, whether that’s research, service, your role as level leader, or administrative duties. In the first column, I put teaching topics in the class I teach. This helps me see the monthly overview of where we’re headed, and what big topics we’re covering each day. As I outline in my work post, you can look per line and take stock of how full your day is, or plan your tasks strategically with the responsibilities already there. One of the things I take very seriously as an instructor is being on top of deadlines and knowing what assignments are happening and when. I find that college students take you a little more seriously when you feel confident in your knowledge of the flow of the class, which is helped by this chart. By listing my assignments on the bottom and the weeks across the top, I use my trusty Pilot Juice Pens to shade the timeframe of those assignments. I start on the day I launch the assignment, darken the date they are due, and continue to shade afterward to indicate when I will be grading those assignments. This gives me (and my students) a more complete picture of an assignment. The most helpful part of this is breaking down our 2 huge group projects – I can easily see the cascade of deadlines, as well as how many things they are juggling in any given week. You can use this for much of anything – your projects at work, your year’s cycle like I do in my job, housing placement and community events for residence life folks, research process… anything! See how you can repurpose this timeline for work in my Bullet Journal for Work post! This simple but immensely helpful layout helps me get a grasp of the arc of the course, and is extremely helpful when I learn new courses. It’s too easy to go day to day and execute a lesson plan – it takes much more effort to make connections across each day, to build throughout the semester. Inevitably, I make this layout every semester. I teach twice a week each semester so I draw this out with Week 1 Day 1, Week 1 Day 2, Week 2 Day 1… and so on. I jot in the basic deadlines so I know what the students are dealing with. Then, I add in the big activities and concepts we’re talking about and learning that day. Stepping back I can see the building blocks and the many connections that overlap each week or day, and can be more intentional about connecting backwards to previous ideas while also foreshadowing and laying groundwork for future concepts. This practice alone has made me half the teacher that I am today! You should know, my actual lesson plans are digital. I am all about paper planning until it is a severe inconvenience – so I rely heavily on Google Docs to be my detailed daily lesson plans. In those documents, I outline the supplies I need, my agenda, and then detailed notes on the lesson. It is easier to make copies and update for each semester, as well as collaborate with my teaching assistant and co-teachers. One of the biggest game-changers in my teaching was understanding the connection between the intention or purpose to the actual assignment itself. This took me a lot of energy at first but helped immensely when I explained and launched assignments in class. Simply, I write down the major assignments on the left column and then, in my own words, write down the connection to the deeper purpose or objectives of the class or topic. Doing it once makes it easier for me to make it relevant to the students. You all know I’m a huge fan of weeklies – but you can adapt it in so many ways for your teaching or education work by adding different rows and sections. Try a 5-day across the top to maximize space. You can sort your day by the different classes you teach and your teaching-related tasks, and then break off another row for your admin work. If you work in higher ed, that box can be for research or project-related tasks. Then on the next page, you can have your weekend and free space for projects, grading, a weekly review, or other planning. Of course you’ll leave the bottom for flexible sections – whether that’s “to do something this week,” or the dreaded “Grading Section” you can adapt whatever you need. For grading, I find it most helpful to have a visual tracker for the week for each assignment. It can feel pretty grim sometimes, so I have a box for each assignment I need to grade so I can see that I’m making some progress. Are you liking the idea of a weekly? Check out my setups from October, December, February, and March to get a sense of how I’ve adapted mine over the year! These are logs I have in my Google Drive, and I refer to them constantly. Once I get my class roster, I set this up with their names on the left hand side. Then I do 2 different spreads – dates across the top on one for attendance, and then assignments across the top for grading. Attendance is pretty self-explanatory, I mark who is present and who is late or absent for grading in the semester. The assignments log is really helpful as a shared document among teaching teams. We split up grading and each claim a color. I’m usually purple, so anything I grade, I highlight in purple. With this method there’s less confusion about who is grading what, and I can jot down the scores I want to give them. By doing this first I can take a pause to make sure these are the grades I want to submit – we are not perfect, so points may be adjusted here quickly before being finally sent to the LMS. Throughout the semester, much like you’d fill out a gratitude log, fill out this student log to capture specific stories of how they use their strengths and gifts in class. Maybe they advocated for another student, or they brought new perspective to conversations, or easily brings people together. Additionally, make note of their challenge areas – what is their next step, things they can work on? This gives you rich stories to tell parents at conferences, or to the students themselves. The impact it makes when you acknowledge someone’s gifts is truly astounding – and needs to happen more often. You can do this for people you supervise, or even perhaps your teammates’ strengths. Love collections? See how I use them in my bullet journal. As a curriculum writer and Gallup Maximizer, I keep track of the little snafus I hit or improvements I make throughout the semester. If I notice a prompt isn’t working, an activity needs clarity, or timing on a topic is off, I will jot it down in this on-going collection. Then, when the Magical Time of Summer arrives, I know what changes I can make – and have record of it outside of my faulty memory. It is extremely frustrating to work for or with someone where you have to figure out what they want – in an effort to not be “that guy,” I have started a list of what my personal quirks are and what I expect from students and teaching assistants. It makes a stronger partnership when you can name these things from the beginning rather than stumble upon them later. As I think of them, I jot them down. We’re always looking for ways to make learning come alive, so why not capture your list of TED Talks, videos, books, or other websites to check out in one place? Another powerful mechanism for learning is through your own stories. This is especially helpful if you are given a curriculum to teach – it is difficult to feel like you really own the material. By going through the different concepts, take time to look back at what stories YOU already have to exemplify and illustrate those ideas. This exercise can equip you with an amazing tool box to use in the classroom. If you facilitate a lot of discussions or activities, this may be the perfect collection for you to keep track of strong questions to add to the mix to spark new thoughts for students. Want more tips? I share a few more ideas in an update here. WHOO. So that was A LOT but certainly not exhaustive – what lists are you keeping? What layouts have you used? Perhaps something was useful for you, or inspired a way you can adapt to your own needs – let me know in the comments! Excellent post PPP! I am not an educator (well, not by profession anyway) but I really appreciate what you have done. There is a lot of cross over between the teaming you are doing in class and the teaming I do in my legal work as in-house counsel in a government agency. Thanks for the share. I would love to see how that works out for you – I’m also looking to get ideas for improvements and eval stuff! Yes! The Semester Chart is definitely something I’ll be adapting into my bullet journal soon. Thanks for sharing this! I’m glad it was helpful! Thanks Amal! I’m thinking about recommending the Bullet Journal system for our incoming freshmen class (120). I’ve introduced BuJo to one my classes and several of the students have taken to it. I think the students will actually use the Bullet Journal because of its personalized and organic nature over some pre-packaged, expensive student planner. What do you think of that idea? And do you have any recommendations for modifying the system for students (especially some of your upgrades)? I’m a BuJo junkie and I’ve only seen a couple of posts written on the subject. I follow you on Instagram and love your lettering posts! Since I first asked you this I have thrown myself into learning about SketchNoting, Doodle Revolution, etc. This week I get to put it all to use as I am teaching our incoming freshmen (HS) students how to use visual note taking as another tool in their study skills toolbox. They will also be attending a Bullet Journal session being taught by one of my juniors. We have opted not to buy school planners, but will have the student develop their own Bullet Journal systems. I really like the semester chart and plan to add one to my school planner ASAP! Thanks for sharing these ideas. This is perfect! Thank you so much for posting this! I have been using ECTP for 2 years and it has not been ideal for high school lesson planning. Was looking for a (less expensive) more practical alternative for next year and this is it! I can hardly wait for the new school year to begin! Great post! Very helpful! Definitely going to include #14! 🙂 Do you know of any elementary school educators that use a bujo? I would find that really helpful too. Thanks!!! I don’t off the top of my head! I know that there are groups like Bullet Journal for Professionals and one for Teachers as well on Facebook that might be helpful! I’m an elementary teacher trying bullet journaling right now. I’ve been wondering the same thing. Thank you, I started bullet journaling and am in love. I feel so much more accomplished. I am a teacher and this year was a little challenging. At first I was thinking of combining a work and personal bullet journal, this seems this could help me grow as a teacher. If you want to talk pedagogy and teaching with intention…… that’s my jam!! I hope this helps you reimagine what you can do with your students! What are you thinking of trying? What do you currently do? I love learning from other teachers! Hi there, do you use your bullet journal for school and personal life? I am a teacher, I’d like to start a bullet journal, but I would also want to take conferring notes with my kiddos inside of my bujo. Any thoughts on recording data inside of an personal bujo? Thanks! Hmm – it depends! How many students do you have? I have about 26 a semester if I teach one class, and I can easily use initials to reference each student with minimal identifying information to protect their identity. I never put grades in my bullet journal, but if it’s abbreviated I think that’s also fine. What do you think about that? I am a college professor and love this post. I especially like your ideas 10-16. Gifts and Edges-brilliant. And Tweaks-never thought about doing that in my Bullet Journal. I usually keep notes on curriculum changes that are needed with the course materials, but I don’t always see these notes until after a new class has started. I will be keeping these notes in my journal from now on. Thanks for sharing these great ideas! Thank you for your feedback, Laurie! That tweaks page has saved my behind in so many cases – especially now as I revamp some curriculum this summer. Would love to hear any new ideas you develop as well! Hi Jessica, thanks for sharing all your ideas! I’m learning a lot from your process. Can’t wait to try this system out when I return to teaching next semester! Yes!! I would love to hear how it works for you, or new ideas that you come up with. The monthly printout… do you mean the blue header monthly calendar? That’s the calendar I create and give to my students – it’s a visual way for students to see deadlines and assignments laid out. That’s not part of my bullet journal but it’s an important part of my teaching for sure! Does that answer your question? Yes, that does answer my question…thank you! My principal’s name is Kendra Wallace. We are at The Joseph Sears School in Kenilworth, Illinois. 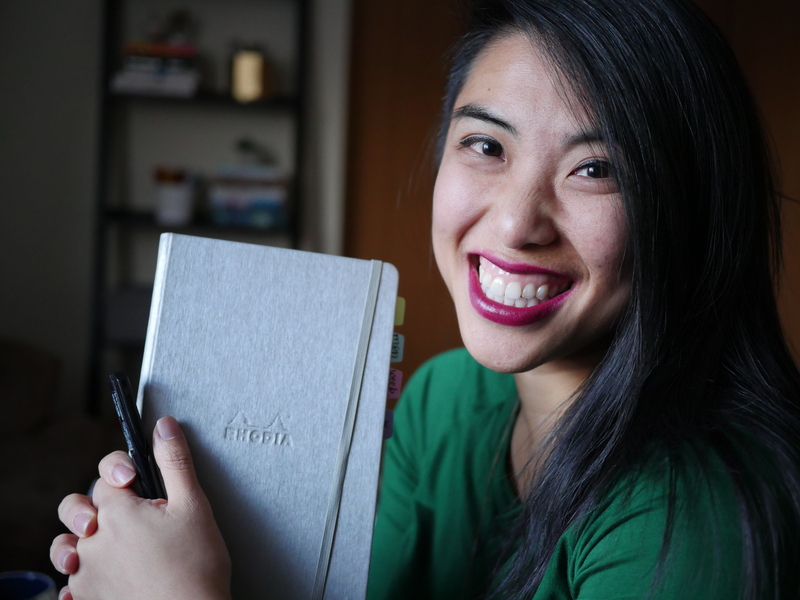 She is obsessed…I mean obsessed with bullet journaling and loves your ideas! My principal shared your blog with our staff. I love your ideas. Where did you buy your stencils? You are so sweet – and who is your principal, that’s so nice?!?! I don’t think I’m using any stencils in this particular post 🙂 Can you specify which one you mean? I made it by creating tables and typing in the numbers in a slide-show! Hahaha if you even can believe it! This is a great post, thanks very much. It’s very helpful. I teach high school students and oversee support in our school, so I wanted a one-stop place for all of that. Are your individual lesson plans in a different binder, digital or ? I find this one of the most difficult aspects of being organised – sometimes I need more notes than other times and I have things everywhere. I am still hunting for the best way to keep it all together – long term and short term planning. Hey! I’m publishing a post on this very topic first thing tomorrow (Thursday) so hopefully that will answer some of those questions ! I for sure keep lesson plans digital. It’s just too hard to write them out, that’d be crazy! Thank you for this really great post about bullet journaling in higher education 🙂 You got me thinking on a few new pages to incorporate into my lovely moleskine. Something nice to do during Christmas holiday! I’m keeping track of favorite (or new) instructional methods and cool assignments to do during class. Especially when I’m visiting someone else’s classroom I jot down ideas to use in my own teaching. Sometimes when taking a course or workshop I’m not even paying attention to the content but just observing how others teach, haha! I LOVE those ideas! I need to add those collections to my list… I am the same way – I pay attention to content like 30% of the time but mostly I’m studying the teaching choices they make! I am inspired by your video to try this in my intervention room at school. Traditional lesson planning isn’t effective for my students as each lesson is differentiated for each student on that day. I’ve been an interventionist for 5 months now and I haven’t been able to find a system I like. I think this will work for me! Thanks! Susan!! How has this been going for you?? I love learning how people use this system to make their teaching better. I had to start somewhere so I started with my personal life. It’s messy and trial and error, but it’s calming after a hectic day. I was just thinking last night about finally introducing into my schoo life. I love it so far! Hi Jessica! These are fantastic ideas, many of which I’m going to start incorporating — thank you! I have a rather detail-oriented question: on #8 (Weekly Overview), you show boxes in a grading section, but I can’t figure out what they all correspond to. I’m assuming the box to the left of the assignment title is for getting all the grading for that particular assignment done, but what are the rows of boxes underneath? You have 25-26 students, but one assignment shows 12 boxes and one shows 15… I’m just curious as to how you’re breaking the grading down!